Discussion: A 500 mb shortwave trough lies to our east with some weak ridging to our west. At the surface there’s an area of low pressure offshore in the gulf of Maine, while the remainder of the east coast is under the influence of an elongated area of high pressure. 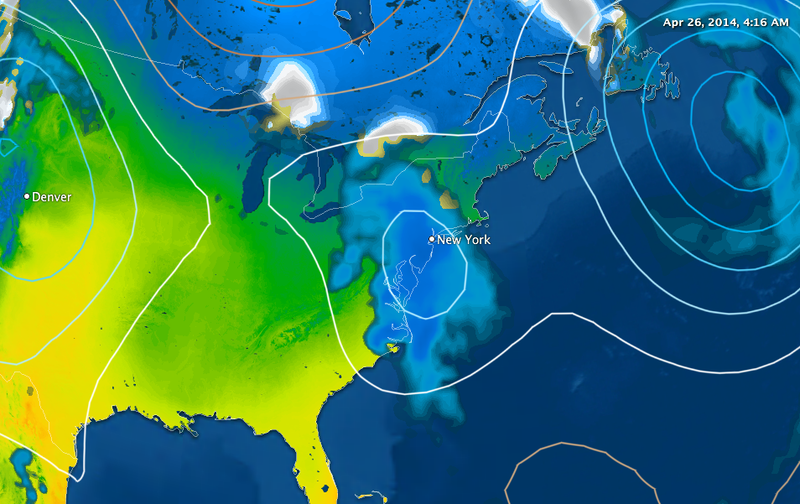 Forecast: 500mb heights are expected to gradually rise over the tri-state through tomorrow. The surface high approaches the region tonight. As a result, the gusty northwest winds should relax this evening. highs near 60ºF today. with clear skies and calm winds, lows 28-34ºF overnight, and highs closer to 65ºF tomorrow. A shortwave trough just east of the rockies, moves in late tomorrow from the west. An associated surface low tracks into New England on saturday, bringing in some unsettled weather for the first half of the weekend. Clouds increase late Friday, with some rain developing late night and continuing into Saturday. Enjoy!